Meditel360 in involved in giving back to the community, volunteering their time sharing their experience to worthwhile causes. In particular we are involved in the following project. VENTure is a newly-founded think tank, established in November 2012, designed to meet the unmet needs of individuals who are dependent on ventilators. 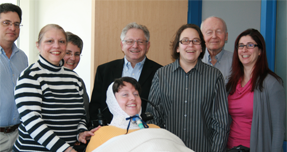 This organization was founded as a result of many of the profound, even life-threatening, challenges that ventilator-users in the Northeast experienced as a result of the devastation caused by Hurricane Sandy. While the goals of VENTure far exceed this isolated issue, the circumstances that were generated as a result of the shortcomings following Hurricane Sandy brought to light just how socially pervasive these challenges are, and how ill-equipped society often can be in meeting the needs of some of its most vulnerable citizens. VENTure is a nonpartisan, nonprofit think tank generating ideas and solutions to address challenges faced uniquely by people dependent on ventilators. We are a multidisciplinary group of experts and advocates, from such domains as respiratory therapy, physical therapy, occupational therapy, health policy, nursing, disability studies, private business and many ventilator-dependent people themselves, with experience well suited for devising strategies to help improve daily life for people dependent on ventilators. VENTure is an ongoing effort that advises proactively to meet the concerns of the ventilator-dependent community and responds reactively to address the changing political and social environments.